A Bitter Saga: The Sago Mine Disaster The miners and townspeople recall a grim week in a West Virginia coal town: an explosion, prayers amid worst fears, false hopes, a cruel twist and then a final realization that 12 workers are dead. The miners and townspeople recall a grim week in a West Virginia coal town: an explosion, prayers amid worst fears, false hopes, a cruel twist and then a final realization that 12 workers are dead. A makeshift memorial for some of the miners killed in the Sago disaster. This week the nation suffered its worst mining disaster in four years. 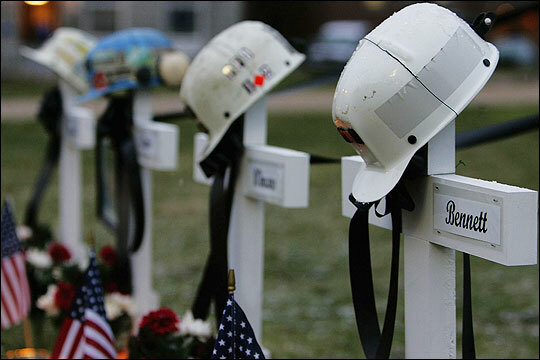 Twelve men died deep inside a West Virginia coal mine following an explosion. The tragedy was compounded when the miners' families were given false hope that their loved ones had somehow miraculously survived. For three hours they waited to greet the miners, only to be told that in the end they had died. NPR's Frank Langfitt was on the scene and recounts the two-day ordeal through the voices of the people who lived it. FRANK LANGFITT: Denver Anderson began work at 6 AM Monday. That's first shift at the coal mine in the tiny community of Sago, West Virginia, about 100 miles northeast of Charleston. He was still half asleep as he rode into the mine on a diesel-powered buggy. About two miles in, he felt an explosion. DENVER ANDERSON: There was a lot of heat. A lot of dirt, rock. Everything was dark. That wasn't no explosion sound to me. I heard just a big gush of air and heat to you and gravel and dirt and dust and smoke and--I tried to turn around and throw my arm up to protect my face. I lost my hat and my glasses, and one guy was operating the ...(unintelligible), it blowed him off of it and busted his hat. LANGFITT: The air is so clouded with dust that Anderson can't even see his feet. He and the other miners feel their way towards the surface. But another group of miners is deeper inside and they're trapped. Ten minutes after the blast, their fellow miners rush back to rescue them, but dangerous levels of carbon monoxide turn them back. By midmorning, friends and family members begin gathering at Sago Baptist Church several hundred yards from the mine. Pastor Wease Day says the numbers and the heat inside just swelled. WEASE DAY: They just kept coming and kept coming. This building was extremely hot. We were running two air conditioners and all the fans and windows were open as well. LANGFITT: The rescue crew enters the mine around 6 PM. The company, International Coal Group, begins drilling a hole to test air where the miners may be trapped. Tuesday morning, coal company president Ben Hatfield announces results from the air test. BEN HATFIELD: The air monitors attached to the drill recorded carbon monoxide of 1,300 parts per million. This carbon monoxide level far exceeds regulatory limits for respirable air. LANGFITT: Denny Hodges is a Red Cross volunteer and counselor. He's been at Sago Baptist since Monday looking after the miners' families. When he learns about the carbon monoxide levels, he thinks the miners are probably dead. DENNY HODGES: At that point I thought, well, that's it. LANGFITT: Worried about succumbing to carbon monoxide themselves, the rescue crew moves cautiously through the mine. A little before 9 PM Tuesday, company officials go to the church and deliver more bad news. Denny Hodges says it's a turning point. HODGES: Mr. Hatfield came into the sanctuary and I could tell by his body language that he was visibly shaken, and he started out by saying, `We have some bad news,' and there was a groan throughout the whole room. There were some screams. There was, `Oh no,' and he said that the rescue teams that had reached the site had found one body. Back at the mine site, Kevin Stingo(ph) arrives to help treat the miners as they come to the surface. Stingo is a critical care nurse at St. Joseph's, a nearby hospital. KEVIN STINGO: One of the ER nurses was standing outside the tent on the cell phone and I said, `What's going on?' And she said, `We've been told that all 12 are alive and that they're gonna be bringing them out in stages. You know, you just stay here and help.' So they were basically gonna give us the worst of the patients. So we basically, you know, started getting ready, warmed up IV fluids, priming IV lines, getting IV equipment, monitors out, etc. LANGFITT: Then Stingo hears something that shakes him. STINGO: It'd be 12:15, 12:20, a man came in the back of the tent and told us that the information may have not been accurate. LANGFITT: But nobody tells anyone back at Sago Baptist Church, where expectations continue to rise. Pastor Eddie Barker has spent the past day and a half ministering to families of the trapped miners. EDDIE BARKER: The news come that they were going to bring them to the church, then by cell phone some other pastors and some of the family who knew, we thought, well, these men surely will be going to a hospital. Then the talk come, well, if they're gonna bring them here, these men are just totally OK, and then we was thinking, well, these boys have come through this triumphant, you know. LANGFITT: The families make room in the pews to greet the brothers, sons and fathers they thought they had lost. Pastor Barker recalls the excitement. BARKER: We started singing songs and getting ready. The red carpet was being rolled out for them by everybody, and everybody felt great. We spent the biggest part of three hours preparing room for the entrants. LANGFITT: Back at the mine, the first survivor, Randall McCloy, is carried to the surface. Kevin Stingo, the critical care nurse, goes to work. STINGO: He still had his mine belt on. He was covered in coal dust, sweaty, cool to touch. He was moaning, but still unconscious. He had on jeans and a quilted flannel shirt, common to mine folks around here. LANGFITT: State troopers clear the road to make room for the ambulances that will take the survivors away. Stingo accompanies McCloy in the first ambulance. It leaves before 2 AM. STINGO: It's like a parade route. We had police escorts on both side of us. And by the time we got into the town, town was the same way. I mean, along the way there's people blowing horns, flashing their lights. LANGFITT: A little before 3:00, mine officials return to the church. Pastor Eddie Barker remembers they looked serious. BARKER: The state troopers was coming in, lining up along the aisle and around up around front, and we all knew that that was entrance for the miners, and of course, the company CEOs, they come up and lined up on the rostrum, which I thought was normal, also. They was gonna make this great announcement. That was our expectation. LANGFITT: Then Ben Hatfield, the company CEO, delivers the news. LANGFITT: Troopers hustle Hatfield from the church. Family members drift out into the cold misty night, furious and devastated. 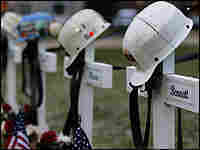 Nick Helms, who's lost his father, Terry, a mine safety officer, captures the thoughts of many. NICK HELMS: And in all reality, they just lied. LANGFITT: Helms says some people wanted to tear the mine officials apart. HELMS: I immediately took my girlfriend, my sister and the rest of my family out because honestly, if they could have got to them, it would have been--there wouldn't have been anything left of those guys. LANGFITT: Denny Hodges, the Red Cross worker, was asleep at home. A colleague was calling for help. HODGES: `They're dead, Denny. They're dead. They came in and they announced that all the miners are dead.' My heart sunk. I couldn't believe what I was hearing. LANGFITT: The next morning, Denny Hodges sits with family members as they wait to tour a makeshift morgue at a local elementary school. After more than two days, the families finally get to see their loved ones. Hours earlier, they were certain it would be a joyous reunion. Frank Langfitt, NPR News. SIMON: You're listening to WEEKEND EDITION from NPR News.